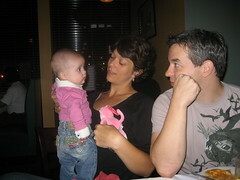 Friday we went to Guru India Restaurant with Angel and Marty. Sophie’s wearing an outfit Angel and Marty bought for her when she was just a few days old. This entry was written by kara, posted on September 29, 2008 at 9:20 pm, filed under Uncategorized. Bookmark the permalink. Follow any comments here with the RSS feed for this post. Post a comment or leave a trackback: Trackback URL.